 Home › Politics News › Buhari, APC Governors Request For New Team To Work With Oshiomhole? (NWC) to work with ex-Governor Adams Oshiomhole if develops National Chairman of the All Progressives Congress (APC) is gathering steam. Actively involved in the process are President Muhammadu Buhari, governors elected on the platform of the party and other leaders. Buhari, The Nation gathered, had on Tuesday night sent APC governors to the current Chairman, Chief John Odigie-Oyegun, to prevail on him to drop his planned return for a second term. The presidency had been jolted by the incident at the South-South APC meeting in Benin where Oyegun loyalists had tried to fight back. Well placed party sources told The Nation that the return of Oyegun for a second term was already foreclosed by Buhari and his strategists. The reports were said to have painted the party to be in a “bad state” and would need a fresh breath of life. It was gathered that the management of party funds, including difficulty in paying staff salaries and alleged payment of curious rent allowance of between N15million and N8million each to NWC members, was part of the security reports. “The President, most APC governors and some leaders of the party have actually foreclosed the return of Oyegun based on some security reports and the need to reshape the party for 2019 poll,” a top source said. The structure of the party, he said, is weak at present and unless it is re-energized, it might not be able to tackle the opposition parties and other forces like the Coalition for Nigeria Movement (CNM) led by President Olusegun Obasanjo. Besides, the party is detached from most members, leading to crises in many states, he added. “What Buhari and these leaders are doing at present is to shop for a good team which will work with Oshiomhole to return APC to the dream of its founding fathers. “These leaders are of the opinion that some NWC members should not come back to office because they did not add value in any manner whatsoever to the party," he said. Consultations are going on between the President and some leaders of the party, especially governors, on how to reshape APC for better, another source said. “The President has expressed his preference for Oshiomhole; it is now left to him to sell the candidate to party leaders. I think this is what he is doing at present. “So far, the President and other leaders may build consensus on Oshiomhole who appears prepared for the task ahead,” the source, a Presidential Villa insider, said. Responding to a question, the source added: “The President has no personal grudges with Oyegun or NWC members but security reports have indicated that the party is in a bad state. “We have a party that cannot pay its own bills, including salaries of staff in spite of the resources at its disposal. 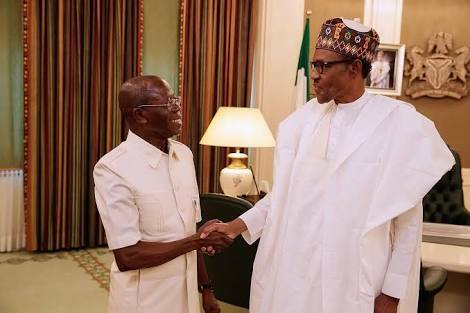 The Nation also gathered that Oyegun knew the game was up following Buhari’s pronouncement of his preference for Oshiomhole as the next National Chairman of APC. An NWC member who craves anonymity said: “The President went ahead on Tuesday night to send APC governors to Oyegun to drop his second term ambition if he had any. “As matter of fact, the rejection of Oshiomhole by the South-South caucus of APC had boosted the re-election aspiration of Oyegun. Asked why Oyegun could not brave the odds, the source added: “Do you expect Oyegun to confront the President of the country? It will amount to political suicide.